Some days, I need a little something to help invigorate my spirit, and comfort my soul. It’s been one of those weeks, I make a conscious effort to wind-down, hum along to soothing music (lately, this Ukrainian contemporary-folk band), and have some tea. Tea is such a great tool for grounding, coming back down to earth, being right here, right now in the moment. I like to stop all else that I’m doing, look deeply into the tea swirling in my cup, catch the warm steam on my face, and just breathe, taking in all those lovely aromas that are released into the air. |’ve been finding such solace in this blend of herbs, inspired by the flavors that remind me of my mami (my grandma). It was always a treat when she’d melt down a disc of chocolate for us, with cinnamon, milk, and sugar, rotating the silky chocolate with her magical wooden whisk (called a Molinillo) until it created a beautiful froth. But as I mentioned, it was a treat, too sweet and too rich for everyday. So, I conjured up those memories, those feelings, with a blend of herbs that is just as tasty as it is nourishing. 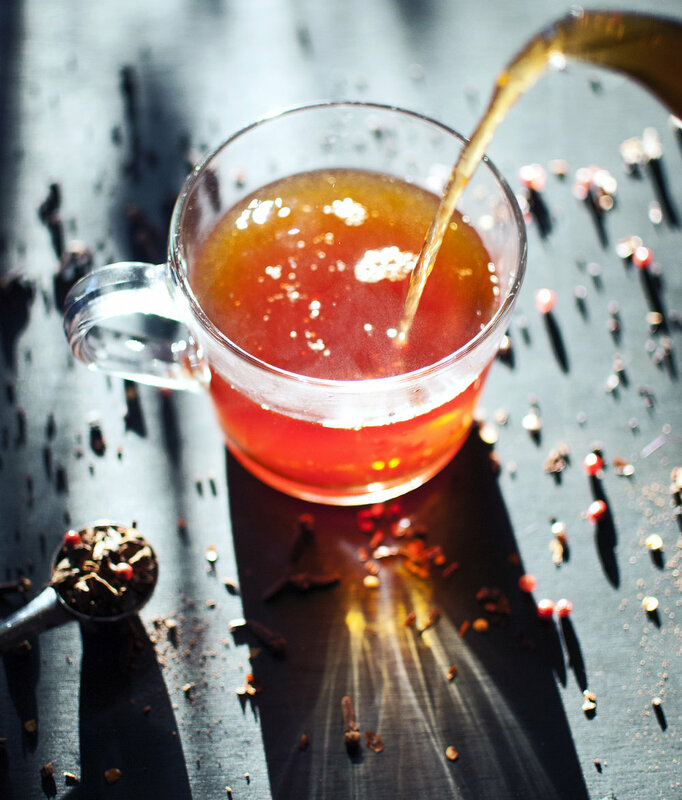 This blend is sort of like a spicy chai, but with a flavor profile that reminds me of my Mexican grandma: cinnamon spice, chocolate, vanilla, roasted nuts, an underlying sweetness, and just a little heat! Honeybush is a South African herb that is earthy and sweet like honey. Roasted Chicory lends a deep, dark flavor, almost like a nutty coffee. I added cinnamon chips and cloves, and for chocolate notes, carob and cacao; all four of these ingredients coarsely ground (I used my coffee grinder, but you could also use a mortar and pestle). I also included pink peppercorns and a pinch of chili flakes (for a little heat!). Pink peppercorns are the dried drupes of the Brazilian Peppertree (Schinus terebinthifolius), native to South America. Although they are not a true pepper, they are sweet and mildly peppery in flavor. I experimented with blending in vanilla extract, which I noticed smoothed out the flavors and enhanced the aroma. I might try adding in a chocolate flavor (from cocoa beans), next, just to see if I like it better than the vanilla. Note: All of these loose ingredients (honeybush, chicory, cinnamon chips, carob, cacao) can be found online. For small amounts, I like to order from Rosemary’s Garden. For bulk ingredients, I shop at Starwest Botanicals (through Amazon, and directly from their website) and Mountain Rose Herbs. Spices like cloves, chili flakes, and pink peppercorns can be easily found at a grocery store. This blend reminds me of my grandma so much, that I’m calling it “Te Amo” (which means, “I love you”). This recipe makes enough for 8 cups. Step 1. In a bowl, combine the honeybush and chicory root. Add the vanilla extract, and blend until the vanilla is fully incorporated. Step 2. Add the cinnamon chips, cacao nibs, carob chips, and cloves to a coffee grinder (or mortar and pestle), and grind until the consistency is a medium coarseness. If the spices are a bit finely ground, don’t worry about it — a little bit of sediment is good, the cinnamon will sparkle in your cup like specks of gold! Step 3. Combine the ground spices to the bowl, along with the pink peppercorn and chili flakes. Use more or less chili flakes, depending on your heat preference (I like mine spicy, so I used the full 1/2 tsp.). Blend the herbs until evenly distributed. 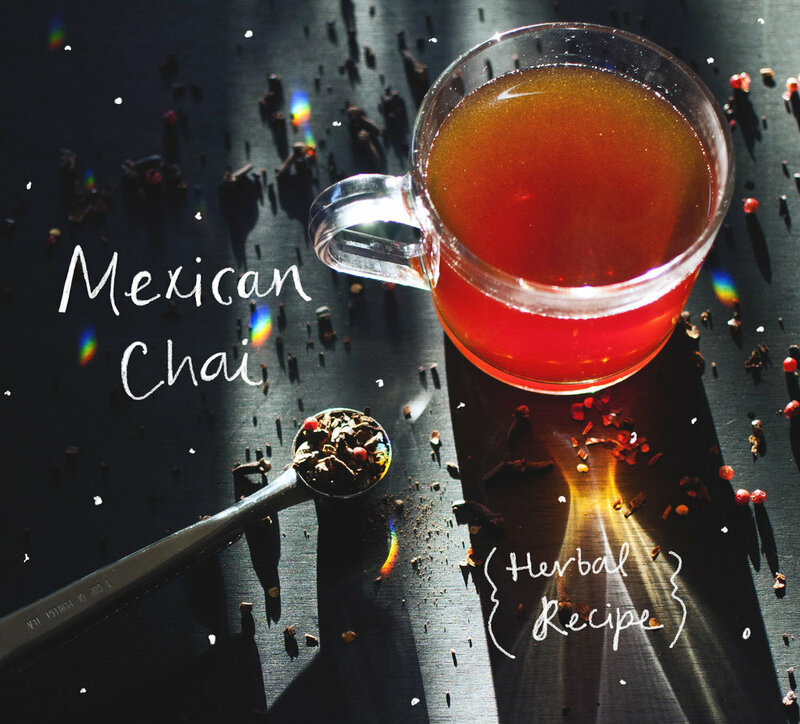 Mexican chai, hand blended and steeped to perfection! To prepare: Measure 1 + 1/2 teaspoons of Te Amo chai per 8 oz. of hot water (200°F). Cover, and allow to infuse for 5 minutes. Strain, and if you’d like, finish off with a splash of milk (I like coconut milk) and a little bit of honey. Enjoy! This tea can also be prepared in a saucepan, and if allowed to simmer, the chicory root will naturally make the tea thick and really creamy. Just add an extra cup of water, and simmer until it’s reduced to the desired amount. The cinnamon and spices will make your home smell incredible! Mexican chai, thickened after simmering. What do you think? Would you chai this?